Is it really possible to not have a care in the world? Probably not, but today sure was close. I actually almost feel guilty for being so relaxed. Quite a sad revelation. I came here to relax, that is what I am doing. So I will also commit to relaxing guilt free. Of course I am not laying around just eating the good food and being pampered. I ran nine miles this morning. My trainer scheduled 10 Yasso’s for me today. As I have referenced before, Yasso’s are named after Bart Yasso from Runner’s World Magazine. He suggests running 800 meter repeats at the minute time of your goal marathon. I hope to run a 4:50 marathon, so I set the treadmill at 6.2 – which is 9:40 per mile or 4:50 per half mile. My recovery was a walk of equal time, so I walked a quarter mile at 3.3, just a tad faster. With warm up and cool down, I covered nine miles. It took me just over an hour and 45 minute with my heart rate averaging 132 (zone two!) and maxing at 154 – still in high zone three. Good thing I am on vacation. I ate breakfast, waited an hour and then ran. If I was at home on a work day, I would have to be on the treadmill by 6:15 to get to work at a respectable hour. After my run I did my core workout that my trainer showed me last week and used the foam roller on my legs. After a good lunch (in my robe!) I put on my swim suit and took in some sunshine. It was in the low 70’s today and not a cloud in the sky. For late September, it was a treat. I also enjoyed the outdoor hot tub with a waterfall. Yes, yes, pictures coming soon. I have to figure out tonight how to download them from my camera to my air book. I am using my iPad mostly. My spa treatment today was a facial. Another indulgence I love and don’t do often enough. While the mask was setting I got a scalp and arm massage. (As well as a bit of a nap too). Before dinner I had time to read in the spa patio. Reading is one of my favorite pastimes. Having most of the day to ready here adds to the relaxing atmosphere. Dinner was wonderful too, although I had to dress casual. Dining in a robe is quite a nice luxury I must admit. I have been communicating with a friend and we are planning our next big vacation together. Here I am, at a spa with no cares to bother me, and I am thinking of the next big vacation. Planning ahead has its benefits, but so does living in the moment. Sometimes it takes getting away – leaving the stress and worries at home – to appreciate the here and now. It also gets my creative thoughts flowing for the next opportunity to do the same thing. I want to enjoy every day. Vacation days as well as normal life days. Some days are fly by the seat of my pants random and others are planned. But each day is unique and brings joys of its own. With every deep breath I take today I exhale a sense of peace. I couldn’t ask for anything more. 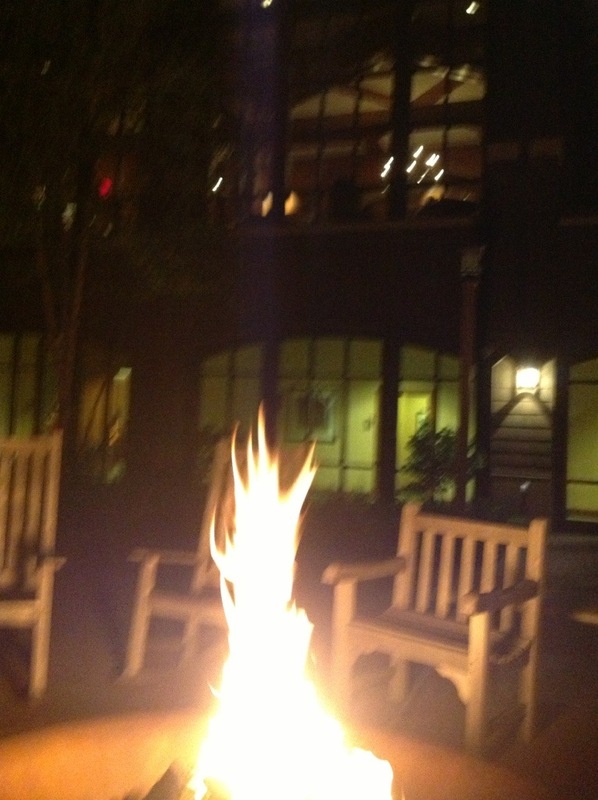 Again I am fireside as I write. My chair today gives me a view of the fire along with the windows of the resort. Here is my slice of peaceful living today. Sounds glorious! I’m living vicariously through you. Thanks! Every time I see someone jogging here in long dark pants I do a double take to see if they have jeans on! None yet, still looking! I almost hate reading these as I sit at work endlessly hoping for just such a day (aka, very jealous). Enjoy every minute and maybe next post just lie to us and tell us its just an okay day and we aren’t missing a thing.